A pastel dream, this variety of quartz boasts a beautiful soft green color. Sometimes called "green amethyst" or "lime citrine," prasiolite is rarely found in nature, so most material available on the market is produced by heating or irradiating amethyst or citrine. Prasiolite is an exciting gem in that it is readily available in large sizes with high transparency and great durability. Refractive index, birefringence, optic character and optic figure. A bull's-eye optic figure is determinative for quartz. The presence of Brazil-law twinning is a means of separating amethyst from scapolite. Misnomer: green amethyst. Green color is rarely found naturally and most are irradiated and/or heat treated. 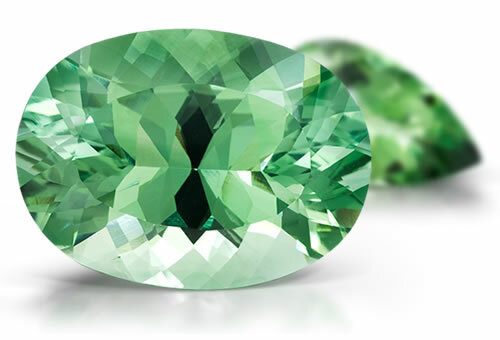 Prasiolite is a type II clarity stone. Stones may contain crystals, negative crystals, liquid inclusions, two-phase inclusions and partially-healed fractures.